Crover House Hotel is a short distance from Oldcastle, Meath, Crover House Hotel is set in a historical and ancient landscape, Crover House Hotel offers a professional and personal service ensuring that Weddings at Crover House Hotel are memorable and treasured. Crover House Hotel offers luxury living within a beautifully modernised and restored building. 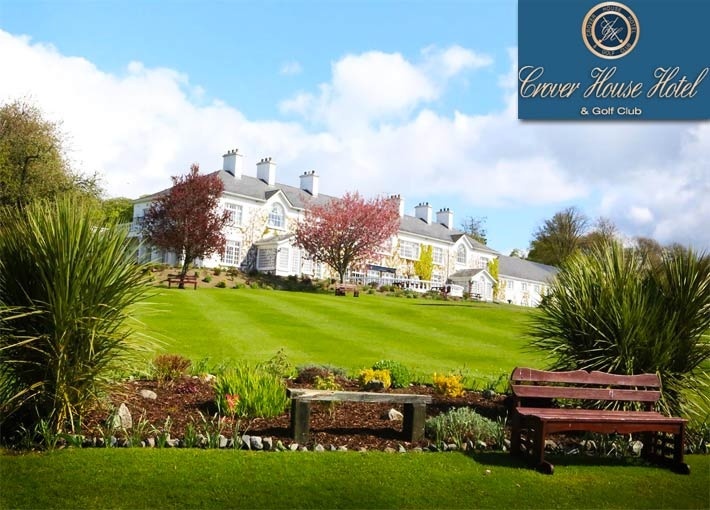 Crover House Hotel is set among wonderfully manicured and maintained lawns. Crover House Hotel has cascading gardens that flow down to the shores of Lough Sheelin. Crover House Hotel presents a professionally designed nine-hole Golf Course which is surrounded by picturesque water and landscapes. There is a large car park that ensures that groups of friends can travel to Crover House Hotel in private vehicles or independent bus transport and park comfortably. The views for the Golf Course are spectacular. This magnificent property is located in the tranquil heart of the beautiful Irish countryside, yet it is situated only 40 minutes from the M3 (Dublin) and 1½ hours from northern border counties. Crover House Hotel is an ideal holiday or short break location, with spacious accommodation on offer, as well as a wide variety of leisure activities nearby. The soothing ambience and the glorious scenery are just two of things that will remain with you long after your stay at Crover House Hotel, no matter how short. Crover House Hotel promise their guests the warmest of welcomes to a friendly and homely environment. Crover House Hotel pride themselves on the personal touch at all times. The Crover House Team will persevere to achieve to leave a long-lasting impression on their guests after your stay at Crover House Hotel. Crover House Hotel pledge that you will enjoy every moment of your visit to Crover House Hotel. The purpose of Crover House Hotel is to combine a lovely tradition of warm Irish hospitality with stunning contemporary style set in a breath taking landscape.